I tend to romanticize things and the State Fair is no exception. I grew up in Ohio, and my memories of going to the Ohio State Fair are picturesque and old-timey and wholesome. I loved walking through the barns, sitting in the hot sun in the grand stand, getting a fistful of tickets for carnival rides, and eating caramel apples, funnel cake, and fresh squeezed lemonade. Evenings were warm and breezy, the darkness kept at bay around the edges of that tiny, colorful, temporary world by the carnival lights. Nights were the best time for the fastest, most spinny rides. Yes, that looks just like my teenage summers. What State Fair is the one from your childhood and what did you love most about it? -- The 2nd largest goat competition in the United States. Whoot! -- And Randall's Racing Pigs. Naturally. Hope to see you at the State Fair! The Fine Print: The button on my sidebar I gave them; they didn't pay for it. They are giving me tickets for my family but that is all folks! EDITED TO ADD: I'm up at Wedded Bliss with an article titled: 'I think C.S. Lewis said it's good for me to have a messy house.' You know you want to read that, right? I was a deprived child. I remember going to a grand total of ONE fair as a kid. I mostly remember the rides. The racing pigs? I've seen 'em. Totally cute. Bring on the funnel cake! We went to our county fair a few weeks ago...so fun! I hope my son will want to do Mutton Busting in a few years. He already practices on the arms of my couch and on the dog! haha! Only 28 days of Shredding left! My "home" fair is the Kentucky State Fair. My great-uncle owns Old Folks Country Sausage, so they sponsored the pig races! I also have fond memories of the Shelby County (Ky.) Fair from when I was really small. They had fun rides and really great horse shows. IF I DON'T KNOW YOU IN REAL LIFE - REMEMBER TO SAY THAT YOU ARE IN TN / ENTERING THE CONTEST. SO I DON'T PULL A WINNER FROM MAINE YOU KNOW? I would love to take the kids to see the animals. We always say we are going to enter projects and try for a blue ribbons, but I've never gotten our paperwork together in time! We probably wouldn't feel comfortable going at night or riding the rides. I'm not local but I just wanted to say....oh man I love that video!!!! Quite a few Connecticut towns still put on agricultural fairs (although I find that a bit of a stretch, considering I couldn't even find a CSA close enough to my house to make it worthwhile to join). The one we usually go to is the Hebron Harvest Fair. It has a good mix of animal barns, live music, fairway games, rides for all ages and temperaments, home improvements, domestic contests.... I love it. It's next week. As a kid, I loved going at night. The lights on the strip rival Las Vegas in my mind. I loved looking at the carnies and all the boys! My kids are not old enough to go at night, yet. But we get mix-your-own rainbow slushies, visit all the animals, and spend too much money on rides that I have to go on with my daughter. My hands-down favorite fair food is sausage and peppers. Of course, this month is also the Big E, aka the Eastern States Exposition - a regional New England Fair in MA. It's pretty awesome, too, but lives up to the size description - kind of like the Disney World of Fairs, and it's not fun with little kids (IMO). When I was about 13, I went to the Wisconsin State Fair. Living near Chicago, that was closer than our own state fair in Springfield. I had a great time, and my favorite memory was feeling a sheep who felt just like a stack of sweaters. Hey, I'm a suburban girl, that was a novel experience. However, that night I came down with what had to be food poisining. It was awful! Funnel cakes, I get those at the flea market, but of course I'm always wearing black...bad case of dandruff? Not quite! Ah-you know I was an 80's teen too-u r cracking me up with JCM, how 'bout a little Jack and Diane?? Love your memories of Buck Eye State Fairs, so romantic!! Ok, I grew up here in Nashville going to that fabulous state fair in question. I didn't go there so much as a teen but as a kid, oh boy, was it magic! Tossing the tennis ball in the goldfish bowl and getting my goldfish (always Goldie, Goldie II, III and so forth) in the plastic bag who would inevitably die, but I seemed to forget that every time. Cotton candy. Spin art. The rides! (The fun house being a particular favorite)The freak shows! "POPEYE" (the elderly gentleman who could pop his eyeball out of his head, then the other) and "The Worlds Largest Rat!" my mother refused to go in, due to rodent phobia, but I went in with my dad to see some caged hog sized creature. (I later developed rodent phobia!) And, as a mere tot, seeing my beloved Sonny and Cher in concert there. My mom and her friend whispering (loudly) about Cher's revealing outfit (open all the way down the sides) me being completely in awe of her. Firecrackers going and me, the excited little girl saying "it's the only way to fly!" and a couple smiling at me which only egged me on. Yes, I loved me some Tennessee State Fair!!! PS) Just viewed the JCM video which I had forgotten, you are right- it is so nostalgic! love it! mudmama: Oh no - you are one of many! It's just that I know a lot of these local ladies so they didn't mention it! I'm a local who has somehow never made it to the state fair. I hope to go this year, though! we would LOVE to win tickets to the fair, as we have never been to the TN state fair. I used to go to the WI state fair every year as a kid. Thanks for the chance to win. I am so entering the contest! And your C.S. Lewis post at Blissfully Domestic? Perfection! I went to our county fair (Robertson County) every year growing up. I was in 4-H...YES way. But I do recall that my dad took me to the big time Tennessee State Fair when I was about 9. This was a huge deal to me because my parents were divorced and it was a fun outing. I remember mostly the freak show, sadly enough. We saw some guy who could make his eyeballs bulge. Seriously. I can't make this stuff up. Gosh now I want to go read Charlotte's Web and gnaw on a candy apple! My memories of the fair were of the animal barns, mostly, I loved them and had no idea what their fate was. I still cannot enter them to this day; my husband takes the girls through. And cotton candy....I could live off that stuff. Aww man, I thought I was sitting on some amazing odds! ;) I loved the excuse to reminice, you may have inspired a blog post! That's fun that there are a lot of us locals, hopefully we can all meet sometime. So funny! At the Ohio State game today, I told my brother-in-law that I like going to the stadium for the football, but the people-watching is great. I added, "...but, the best people watching is at the Ohio State Fair." where i grew up (the appalachian mountians of virginia) we were too far away to go to the STATE fair. i didn't go to any state fair until i moved to nashville as an adult! but i have many fond memories of the COUNTY fair--my favorite being the exhibit hall with all the jams and pies, and esp. the paintings and the quilts. it was the most human part of a very weird world. Local, county, and state fairs are something I miss here in TN. I grew up in Ohio too and we had festivals for everything. (My state fair memories involve vomit so I won't share.) We have some festivals and fairs here in TN but man it is flipping hot to go to our county fair the first week of August. We did attend the state fair the first year we lived here and had a good time. I grew up going to the Barnstable County Fair in MA every summer. I loved going to see the bee exhibit and the sheep shearing competition! My favorite memory, though, has to be doing the twist with THE Chubby Checker on stage! 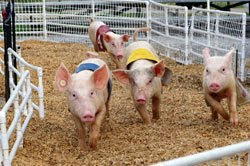 I'm local and would love to make it to the state fair again this year to see those racing pigs! !